CSAW CTF 2015 was this past weekend, and like previous years I fielded a Linux kernel exploitation challenge for finalists in NYC. This year, I wrote the challenge “StringIPC.” Three of the 15 teams solved the challenge. 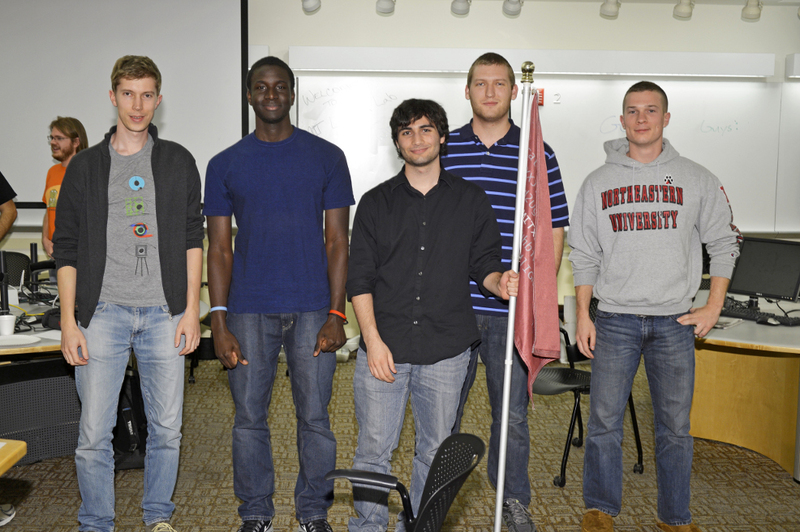 Each team was presented with unprivileged access to a Digital Ocean droplet running 64-bit Ubuntu 14.04.3 LTS. 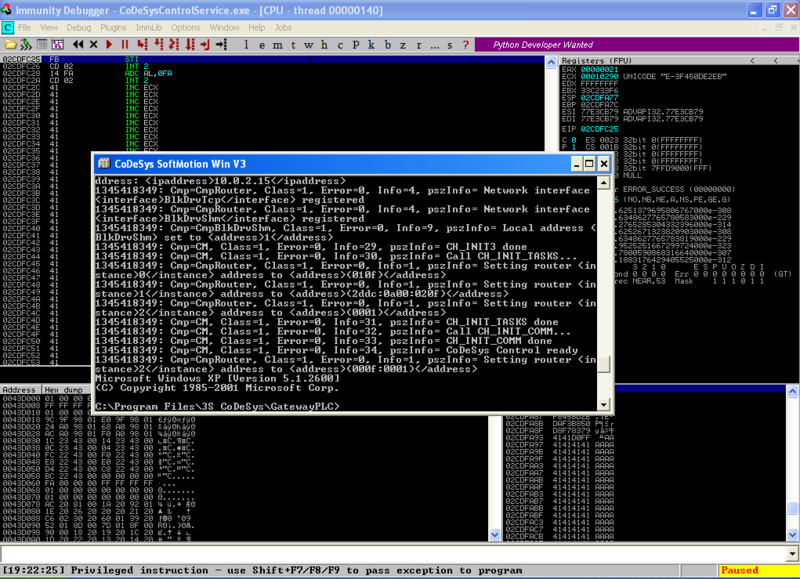 The vulnerable kernel module StringIPC.ko was loaded on each system, and successful exploitation would allow for local privilege escalation and subsequent reading of the flag. The call to krealloc() in the bolded lines resizes the channel buffer itself. This function allocates a new buffer of the given size, and if successful copies the contents, frees the old buffer, and returns the pointer to the new buffer. If the allocation fails (due to memory pressure or an unreasonably large allocation size), krealloc() does not free the old buffer and instead returns NULL. This is handled properly by the code above. While the StringIPC function realloc_ipc_channel() checks the return value from krealloc() for NULL, it fails to check for ZERO_SIZE_PTR. By providing a size variable calculated to set new_size to 0xffffffffffffffff, the addition of 1 results in a zero-sized allocation being requested. The return value circumvents the NULL check, resulting in channel->data = 0x10 (16) and channel->data = 0xffffffffffffffff. 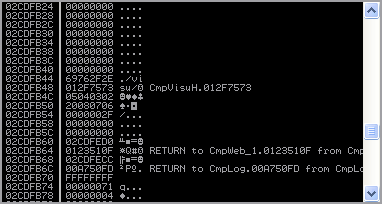 This effectively opens kernel memory for reading and writing through subsequent calls to the CSAW_SEEK_CHANNEL, CSAW_READ_CHANNEL, and CSAW_WRITE_CHANNEL ioctl commands. Thus, we achieve arbitrary kernel read and write primitives (at an offset of 0x10). This vulnerability may be mitigated by checking if new_size is zero, or by checking the return value of krealloc() with ZERO_OR_NULL_PTR(). As mentioned above, each team was given access to a Digital Ocean droplet running 64-bit Ubuntu. Unlike previous years, a number of modern kernel security mitigations were enabled. 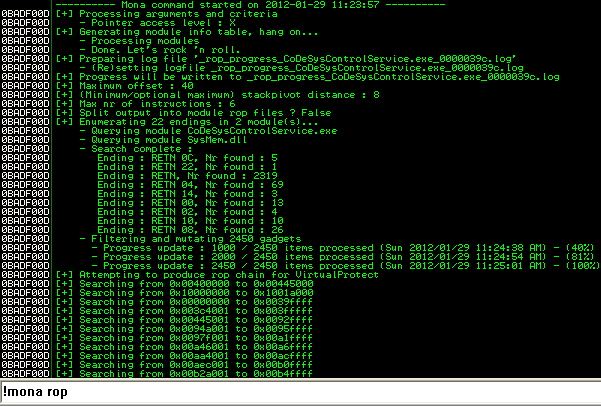 Specifically, SMEP was enabled and access to /proc/kallsyms and dmesg was removed. SMEP (Supervisor Mode Execution Protection) is a security feature on modern Intel CPUs that disallows execution of user pages in kernel mode. Since Linux uses a split-memory model where user and kernel share the same address space, Linux kernel exploits will traditionally overwrite a kernel function pointer and redirect execution to a payload mapped in userland. While SMEP is enabled, this is no longer possible and results in an oops. /proc/kallsyms is a user-accessible virtual file that lists the symbol names and addresses of all non-stack symbols in the kernel. This is a major information leak and allows attackers to easily locate and target global kernel variables for memory corruption and find kernel functions to assist with privilege escalation. On the challenge VM, the security setting /proc/sys/kernel/kptr_restrict is set to 1, meaning that every symbol will have an address of all zeroes. Access to the kernel log provides an additional opportunity for information leakage due to the verbosity of certain drivers, which sometimes leak kernel addresses. In addition, oops logs are printed here which contain a plethora of information about kernel crashes and dump sections of kernel memory. To disallow unprivileged access to the kernel log, the security setting /proc/sys/kernel/dmesg_restrict is set to 1 on the challenge VM. To solve this challenge, contestants must develop an exploit in the presence of these security mitigations. With the ability to read and write arbitrary kernel memory, the exact technique to leak target objects and achieve privilege escalation is a matter of elegance and creativity. However, since CTF is a matter of developing fast and dirty exploits as quickly as possible to beat out other teams, let’s ignore the “elegance” and “creativity” elements of that statement. To circumvent SMEP, I forewent obtaining kernel code execution and instead performed a data-only attack to locate and modify my process’ credentials in memory. To locate my creds in memory, I simply leaked the entire kernel heap and scanned for a unique signature generated by the exploit. Thanks to the use of copy_to_user() and strncpy_from_user() in CSAW_READ_CHANNEL and CSAW_WRITE_CHANNEL, page faulting is gracefully handled and accesses to invalid kernel addresses are not fatal during this process. By setting comm (via prctl()) to a randomly generated string, we can scan kernel memory for this unique 16-byte string and verify that the previous two qwords look like valid kernel pointers. A Furby is an evil robotic children’s toy wrapped in colored fur. Besides speaking its own gibberish-like language called Furbish, a variety of sensors and buttons allow it to react to different kinds of stimuli. 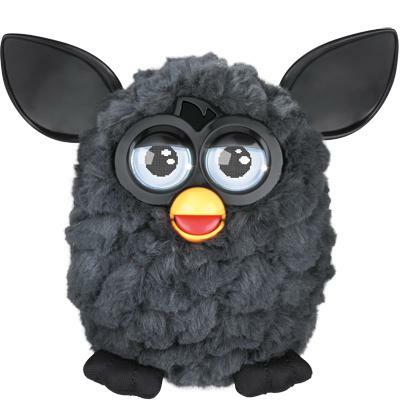 Since its original debut in 1998, the Furby apparently received a number of upgrades and new features. The specific model I looked at was from 2012, which supported communication between devices, sported LCD eyes, and even came with a mobile app. Q. There is a high pitched tone coming from Furby and/or my iOS device. A. The noise you are hearing is how Furby communicates with the mobile device and other Furbys. Some people may hear it, others will not. Some animals may also hear the noise. Don’t worry, the tone will not cause any harm to people or animals. Digging into this lead, I learned that Furbys in fact perform inter-device communication with an audio protocol that encodes data into bursts of high-pitch frequencies. That is, devices communicate with one another via high-pitch sound waves with a speaker and microphone. #badBIOS anyone? This was easily confirmed by use of the mobile app which emitted a modulated sound similar to the mosquito tone whenever an item or command was sent to the Furby. The toy would also respond with a similar sound which was recorded by the phone’s microphone and decoded by the app. Upon searching, I learned that other individuals had performed a bit of prior work in analyzing this protocol. Notably, the GitHub project Hacksby appears to have successfully reverse engineered the packet specification, developed scripts to encode and decode data, and compiled a fairly complete database of events understood by the Furby. Since the open source database of events is not currently complete, I decided to spend a few minutes looking at the Android app to identify how it performed its audio decoding. Using jd-gui, I then decompiled classes-dex2jar.jar into a set of .java source files. I skimmed through the source files of a few app features that utilized the communication protocol (e.g., Deli, Pantry, Translator) and noticed a few calls to methods named sendComAirCmd(). The name generalplus appears to identify the Taiwanese company General Plus, which “engage[s] in the research, development, design, testing and sales of high quality, high value-added consumer integrated circuits (ICs).” I was unable to find any public information about the GPLib/ComAir library. However, a thread on /g/ from 2012 appears to have made some steps towards identifying the General Plus chip, among others. Near the end of the function was a call to the very large function ComAirDec(), which likely was decompiled with the incorrect number of arguments and performed the bulk of the audio decoding process. Data was transformed and parsed, and a number of symbols apparently associated with frequency-shift keying were referenced. Itching to continue onto reverse engineering the hardware, I began disassembling the device. Actually disassembling the Furby itself proved more difficult than expected due to the form factor of the toy and number of hidden screws. Since various tear-downs of the hardware are already available online, let’s just skip ahead to extracting juicy secrets from the device. 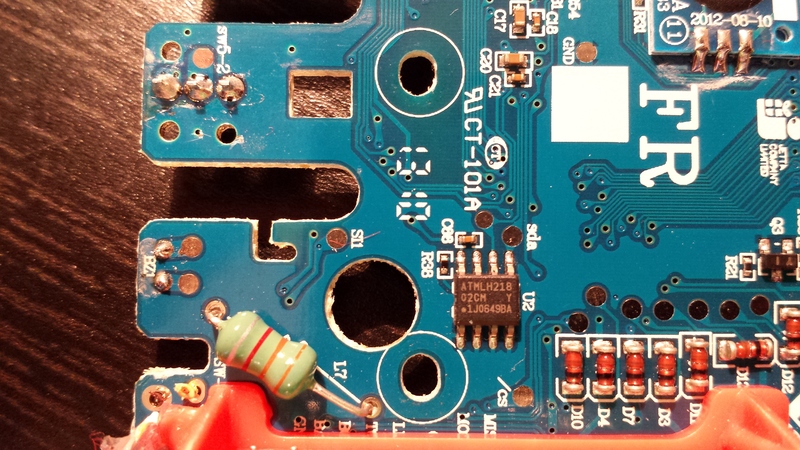 The first feature I noticed about the boards was the fact that a number of chips were hidden by a thick blob of epoxy. This is likely meant to thwart reverse engineers, as many of the important chips on the Furby are actually proprietary and designed (or at least contracted for development) by Hasbro. This is a standard PCB assembly technique known as “chip-on-board” or “direct chip attachment,” though it proves harder to identify the chips due to the lack of markings. 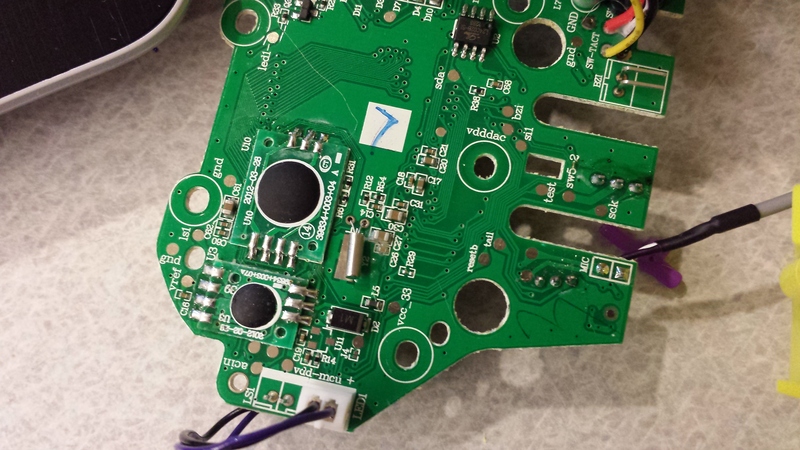 However, one may still simply inspect the traces connected to the chip and infer its functionality from there. For now, let’s start with something more accessible and dump the exposed EEPROM. By googling the markings, we find the datasheet and learn that it is a 24Cxx family EEPROM chip manufactured by ATMEL. This particular chip provides 2048 bits of memory (256 bytes), speaks I2C, and offers a write protect pin to prevent accidental data corruption. 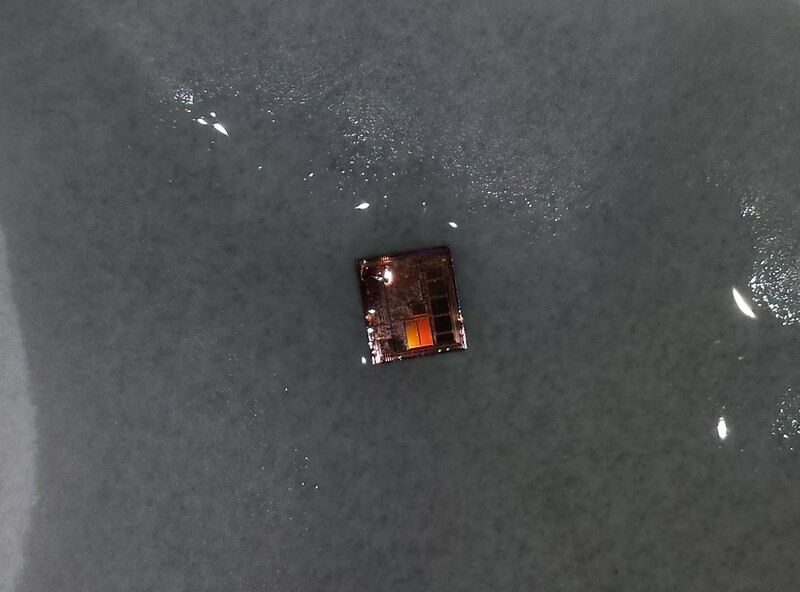 The chip on the U.S. version Furby has similar specs but is marked L24C02B-SI and manufactured by Shenzen LIZE. Using the same technique as on my Withings WS-30 project, I used a heat gun to desolder the chip from the board. Note that this MUST be done in a well-ventilated area. Intense, direct heat will likely scorch the board and release horrible chemicals into the air. Unlike my Withings WS-30 project, however, I no longer had access to an ISP programmer and would need to wire the EEPROM manually. I chose to use my Arduino Duemilanove since it provides an I2C interface and accompanying libraries for easy development. 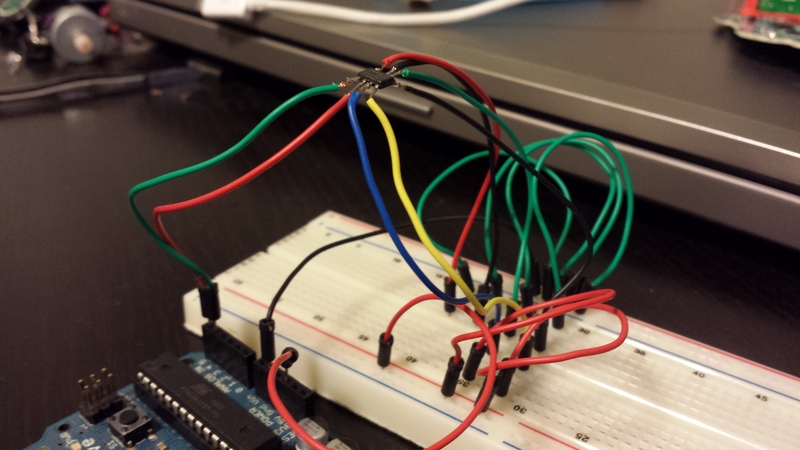 Referencing the datasheet, we find that there are eight total pins to deal with. Pins 1-3 (A0, A1, A2) are device address input pins and are used to assign a unique identifier to the chip. 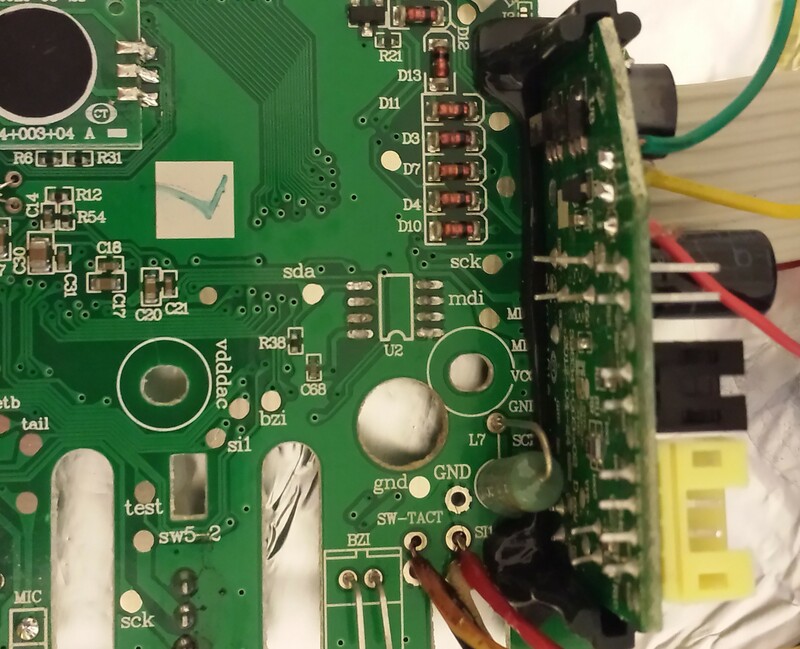 Since multiple EEPROM chips may be wired in parallel, a method must be used to identify which chip a controller wishes to speak with. By pulling the A0, A1, and A2 pins high or low, a 3-bit number is formed that uniquely identifies the chip. Since we only have one EEPROM, we can simply tie all three to ground. Likewise, pin 4 (GND) is also connected to ground. 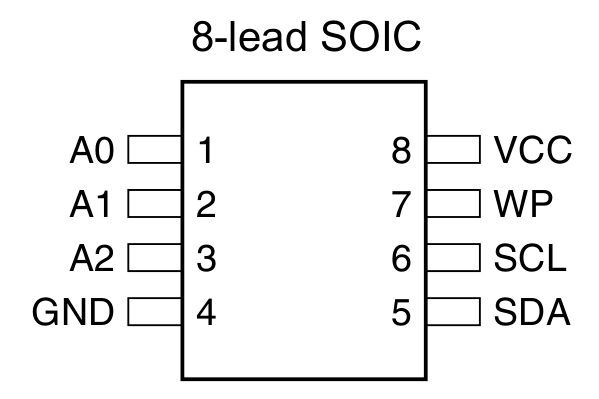 Pins 5 and 6 (SDA, SCL) designate the data and clock pins on the chip, respectively. These pins are what give “Two Wire Interface” (TWI) its name, as full communication may be achieved with just these two lines. SDA provides bi-directional serial data transfer, while SCL provides a clock signal. 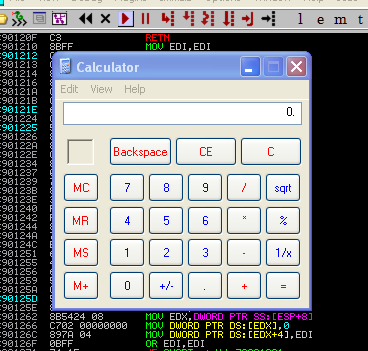 Pin 7 (WP) is the write protect pin and provides a means to place the chip in read-only mode. 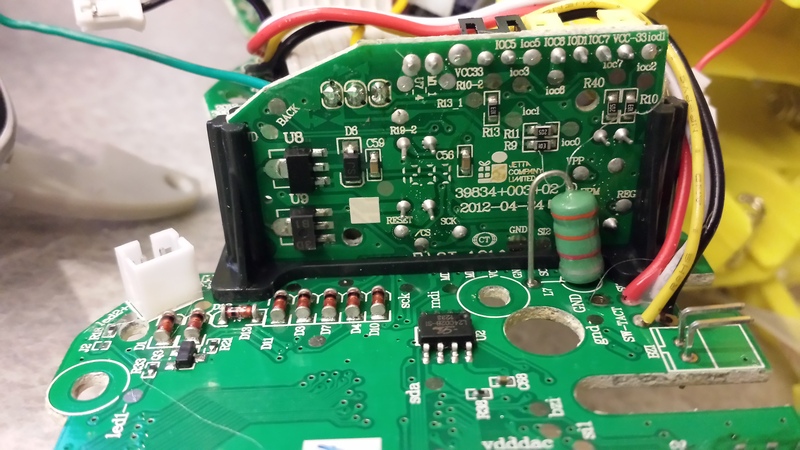 Since we have no intention of writing to the chip (we only want to read the chip without corrupting its contents), we can pull this pin high (5 volts). Note that some chips provide a “negative” WP pin; that is, connecting it to ground will enable write protection and pulling it high will disable it. Pin 8 (VCC) is also connected to the same positive power source. Note that unlike most code examples online, the “MSB” line of code within i2c_eeprom_read_byte() is commented out. Since our EEPROM chip is only 256 bytes large, we are only using 8-bit memory addressing, hence using a single byte. Larger memory capacities require use of larger address spaces (9 bits, 10 bits, so on) which require two bytes to accompany all necessary address bits. Unfortunately, without much guidance or further analysis of the hardware (perhaps at runtime), it is difficult to make sense of this data. By watching the contents change over time or in response to specific events, it may be possible to gain a better understanding of these few bytes. 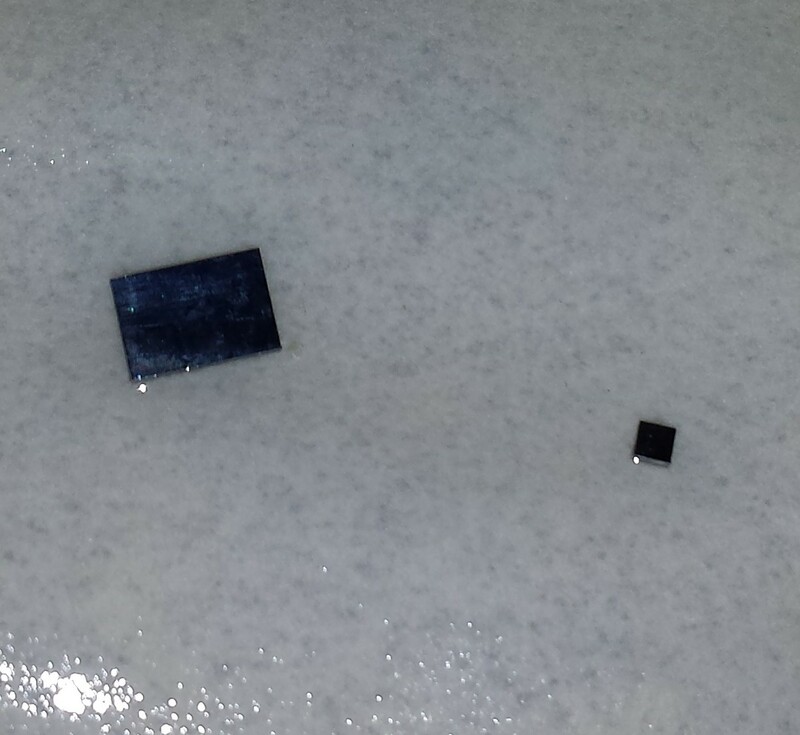 With few other interesting chips freely available to probe, I turned my focus to the proprietary chips hidden by epoxy. Having seen a number of online resources showcase the fun that is chip decapping, I had the urge to try it myself. 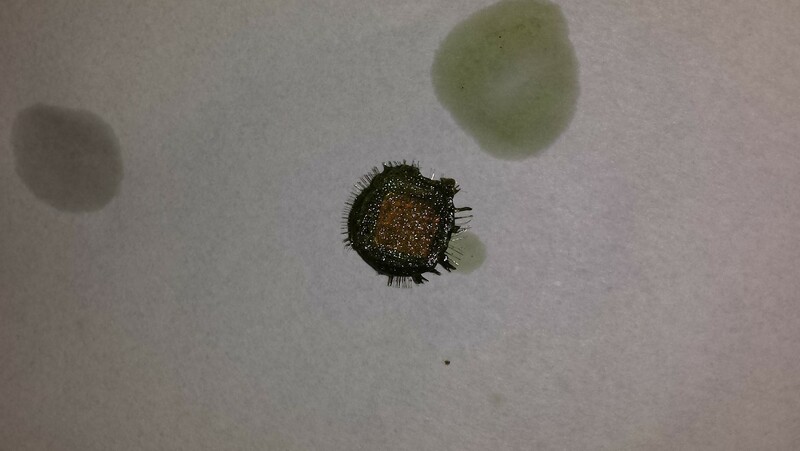 Additionally, the use of corrosive acid might just solve the issue of the epoxy in itself. Luckily, with the assistance and guidance of my Chemistry professor Dr. Geoffrey Davies, I was able to utilize the lab resources of my university and decap chips in a proper and safe manner. First, I isolated the three chips I wanted to decap (henceforth referenced as tiny, medium, and large) by desoldering their individual boards from the main circuit board. Since the large chip was directly connected to the underside of the board, I simply took a pair of sheers and cut around it. 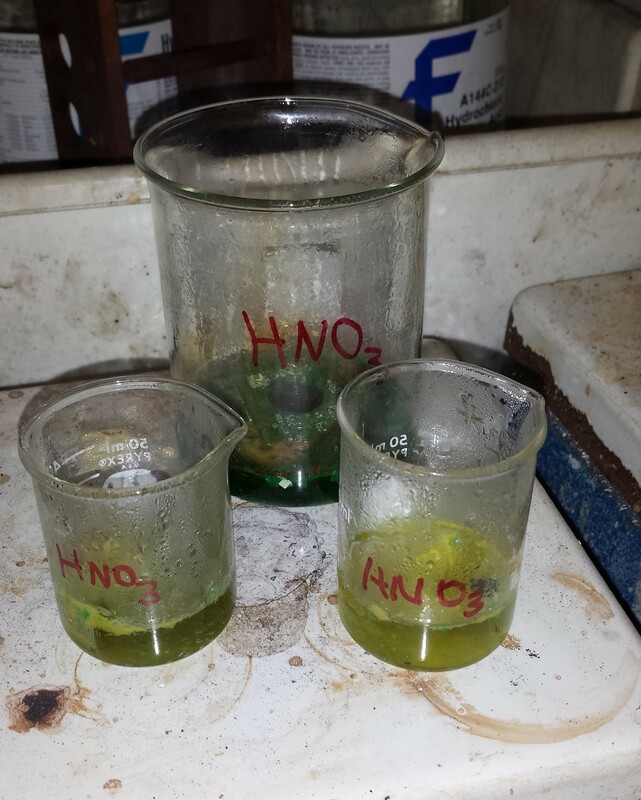 Each chip was placed in its own beaker of 70% nitric acid (HNO3) on a hot plate at 68°C. Great care was taken to ensure that absolutely no amount of HNO3 came in contact with skin or was accidentally consumed. The entire experiment took place in a fume hood which ensured that the toxic nitrogen dioxide (NO2) gas produced by the reaction was safely evacuated and not breathed in. Each sample took a different amount of time to fully decompose the epoxy, circuit board, and chip casing depending on its size. Since I was working with a lower concentration nitric acid than professionals typically use (red/white fuming nitric acid is generally preferred), the overall process took between 1-3 hours. After each chip had been fully exposed and any leftover debris removed, I removed the beakers from the hot plate, let cool, and decanted the remaining nitric acid into a waste collection beaker, leaving the decapped chips behind. A small amount of distilled water was then added to each beaker and the entirety of it poured onto filter paper. After rinsing each sample one or two more times with distilled water, the sample was then rinsed with acetone two or three times. The final step was to take high resolution images of each chip to learn more about its design and identify any potential manufacturer markings. 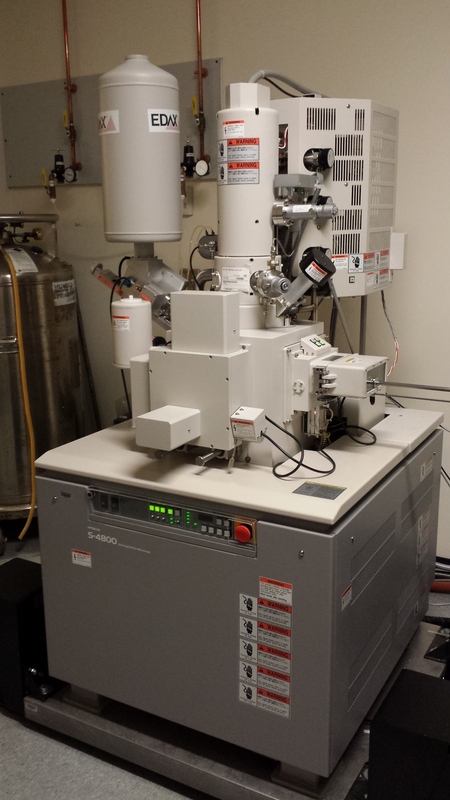 Once again, I leveraged university resources and was able to make use of a Hitachi S-4800 scanning electron microscope (SEM) with great thanks to Dr. William Fowle. Each decapped chip was placed on a double-sided adhesive attached to a sample viewing plate. A few initial experimental SEM images were taken; however a number of artifacts were present that severely affected the image quality. To counter this, a small amount of colloidal graphite paint was added around the edges of each chip to provide a pathway to ground for the electrons. Additionally, the viewing plate was treated in a sputter coater machine where each chip was coated with 4.5nm of palladium to create a more conductive surface. Unfortunately, as can be seen in the image above, the medium chip did not appear to have cleaned completely in its nitric acid bath. 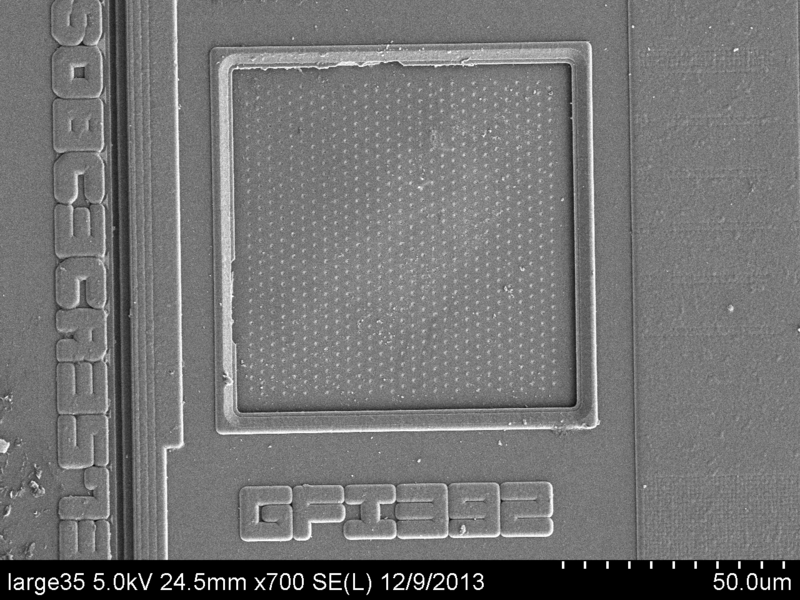 Although it is believed to be a memory storage device of some sort (by looking at optical images), it is impossible to discern any finer details from the SEM image. If you are familiar with of these chips or any their features, feedback would be greatly appreciated. EDIT: According to cpldcpu, thebobfoster, and Thilo, the “cheese grater” structures are likely bond pads. Last post, we identified a stack-based overflow in 3S CoDeSys CmpWebServer and traced the steps necessary to obtain control over EIP. In order to do so, we needed to first circumvent stack cookies, which was achieved by abusing a call to memcpy() and overwriting the function call’s own return pointer. This post, we’ll pick up where we left off and learn how to spawn a shell on the remote host. This means that the stack in our target application is free game and allows fully for a “traditional” overflow. Now, I don’t know about you, but I happen to find that incredibly lame. So, we’ll split the exploitation portion of this post into two sections. In the first section, we’ll take full advantage of the resources provided to us and spawn a shell using the traditional return-into-shellcode method. Since this series isn’t meant to be a simple walkthrough but instead a learning experience, in the second section we’ll spawn a shell again but instead enable DEP for the running application. This disallows us from simply overwriting the return pointer with a pointer to the stack, so we’ll have to first disable DEP using Return-Oriented Programming (ROP) and then return into arbitrary code. Before we proceed to writing the exploit itself, we must first identify any bad characters that might cause issue later on – This means any bytes that may either get filtered out, translate to different bytes, or break the exploit altogether. This is not typically a time-consuming task, but if many characters are filtered or manipulated by the program it can be tedious to identify exactly what is and isn’t allowed as input. A quick and dirty way of approaching this is the “range method,” as suggested by the Metasploit development community. Instead of linearly enumerating a range of 256 bytes and manually (or semi-automatically) testing each byte individually, we instead provide a broader range of bytes in each attempt and systematically narrow it down to specific offenders, somewhat akin to a binary search. Well that’s interesting. Looks like none of our input was copied into the buffer, predictably due to the initial null byte. Since the section of code we’ve looked at thus far has used memcpy() as opposed to strcpy(), it’s reasonable to assume that string functions like strlen() are used at some point beforehand and are causing our buffer to terminate prematurely. We’ll add 0x00 to the list of bad chars and try again. If you look closely, though, notice that 0x09 was translated to 0x20, so we’ll add it to the list of bad chars as well. 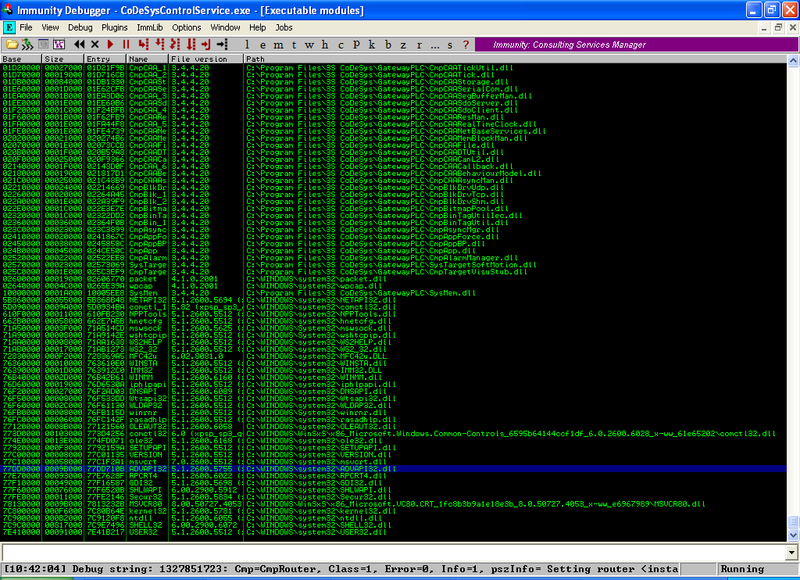 As we can see, most of the offending bytes are URL special characters. With more thorough testing and analysis we realize that, in actuality, some of the chars can be used if positioned correctly in the buffer, but to save potential frustration we’ll just blacklist them initially and consider their usage only if necessary. Cool. We’ve successfully exploited this version of CoDeSys on Windows XP SP3. drop_token    Relinquishes any active impersonation token. getsystem     Attempt to elevate your privilege to that of local system. It’s very rare nowadays to approach a bug without the expectation of needing to bypass at least one or two exploit mitigation techniques. These memory protection mechanisms are most commonly a coupling of DEP and ASLR, but since we are targeting an older version of Windows, ASLR has not been implemented yet, and, as mentioned earlier, even though DEP has been implemented it is in fact disabled for all user applications by default, including CoDeSys. 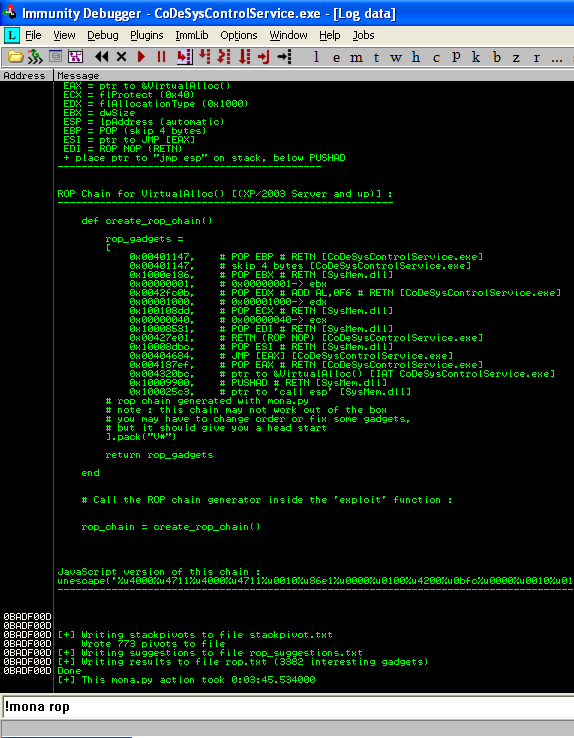 To make things more interesting, let’s manually enable DEP and rewrite our exploit. With the stack marked non-executable, we won’t be able to directly return into code we introduce in memory but instead have to rely on Return-Oriented Programming (ROP). 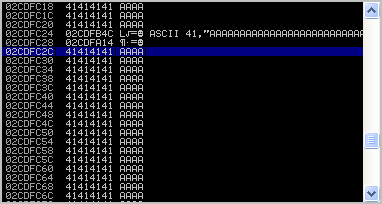 By chaining together the tails of function calls (referred to as ROP gadgets), we can execute arbitrary code piece-by-piece, most commonly to achieve the end goal of disabling DEP and returning into shellcode. Not too bad; we only need to find replacements for two gadgets. We’ll use mona.py to generate a list of gadgets and go from there. 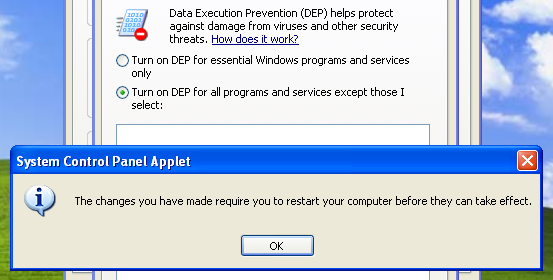 The first replacement gadget we need to find is “pop eax; ret”. This is a fairly common instruction sequence since the x86 calling convention typically stores the return value in EAX, so we should have no issue finding a suitable replacement. Interestingly enough, no suitable replacement gadgets exist in the results. One thing to note, though, is that mona.py defaults its ROP generation to non-OS modules (as well as non-ASLR and non-rebase), so we’ll have to broaden our scope a bit to find the gadget we need. Because the overall goal is to make exploits as universal as possible (working against a wide array of target systems and versions), it’s best to not use modules provided by the system itself since they have a high likelihood of changing between OS versions. However, we’ll take a hit here for the sake of getting a working PoC. The gadget at 0x7ca6f081 will do perfectly. The 00 in “RETN 00” denotes the number of bytes the stack will by adjusted by upon return, which in this case is 0 and parallels the functionality of a “normal” return. The question can be asked in this scenario, why is there such an instruction “ret 0” in the module if it’s the exact same as a “ret”? The answer is that the instruction isn’t actually meant to be there at all. The x86 architecture sports a number of properties favorable for exploit development, namely the fact that instructions are both variable-length and unaligned. x86 instructions aren’t always a defined length in memory, unlike ARM or MIPS whose instructions are always 2 or 4 bytes wide, so we can find a single useful opcode and disassemble backwards until we find an acceptable sequence of instructions. By being unaligned, we can execute instructions at any offset and are not restricted to returning into addresses that, for example, end in 0x0, 0x4, 0x8, or 0xc. Now that we’ve disabled DEP, we need to execute our shellcode. This particular ROP chain will immediately transfer execution to the top of the stack after its completion, which can be observed by studying the last few gadgets. The next two instructions in the gadget (“dec ebx; mov ebx, 0x33c233f6”) are inconsequential and can be safely ignored. As we can see, the PUSHAD instruction also results in pushing the ESI and EDI registers above EBP on the stack, which both contain the pointer 0x77e3cb79. This particular gadget is referred to as a “ROP NOP,” similar to how the NOP (No-OPeration) instruction in x86 simply “does nothing”. When utilized in a ROP chain, we can simply slide down the stack, returning into gadgets that “do nothing” until we reach an interesting pointer. 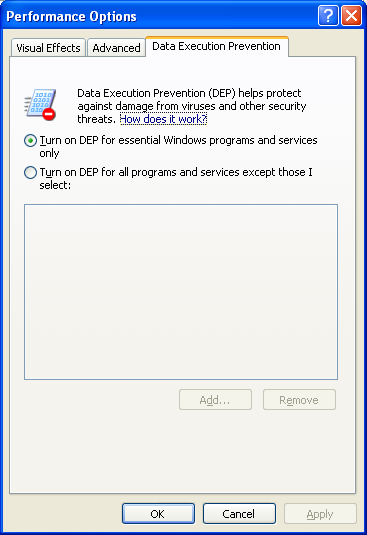 In this case, we execute two ROP NOPs until we return into the NtSetInformationProcess pointer to disable DEP. So are we finished? God, no. Obviously we’re only able to spawn a shell locally (on the remote system), but the techniques necessary to write the appropriate network-capable shellcode without using any of our nine bad chars with size considerations may be better suited for a separate post. Or we could just use a stager. A (hopeful) part three will discuss the implications of ASLR in the target environment, disallowing the use of hardcoded addresses in our exploit.